This weekend the Flanker household was visited by the winter vomiting bug. Mrs Flanker succumbed on Thursday night (and is still suffering the after effects today) while young Master Flanker spent from 1.30 am to 7.30 am on Sunday morning retching his little heart out every 45 minutes. With little Miss Flanker also recuperating after a minor operation it meant an exhausting weekend for yours truly who was in full nursemaid mode for the entire weekend. Domestic God, I can safely report, I am not. My only respite was, fortunately, the sofa, the TV and the 6 Nations (with Mrs Flanker indisposed, th ere was no one to object) and, whilst not exactly serving up a feast of high quality rugby, the opening weekend did, I think, pour a tasty aperitif ahead of the weeks to come. In Dublin Italy did what they always do – provide awkward, obdurate opposition without ever looking like getting a result. Ireland started well, but were soon – like many a team before them - dragged into the attritional abyss that the Italians so enjoy. Ireland’s lineout dominated and their scrum held up surprisingly well, but the rest of their game was, after the first half hour or so, shambolic. Early days, however, and we’ll know more after Paris. England v Wales, despite being error-ridden, lacked nothing in intensity and was a great result (if not performance) from the men in cream. Alun-Wyn Jones will be kicking himself after his yellow card but his public lambasting by Warren Gatland only served to hide the painful truth that, James Hook and the 57 year old Martyn Williams aside, Wales were largely rubbish. To be fair, England weren’t much better but a much improved James Haskell produced a combative, muscular performance on the flank (although his man of the match medal should probably, in my humble opinion, have gone to one of Messrs Borthwick or Easter). The return of Riki Flutey to a moribund England backline cannot come soon enough, however. After watching the Scotland scrummage being savaged by the French on Sunday I wonder what Euan Murray was thinking this morning about his decision not to play on Sundays on religious grounds. Cards on the table here – I’m an atheist. Not a card-carrying, evangelical atheist but an atheist nonetheless. As such (and I appreciate that this comes from an ignorance of the scriptures) my understanding is that “the Sabbath” falls on either a Saturday or a Sunday depending upon your particular persuasion. It follows that, as pretty much all professional rugby is played on a Saturday or a Sunday, being a professional rugby player is somewhat incompatible with holding such fervent beliefs. That said, I can think of only two words to describe the French – effing ENORMOUS! Hope everybody is on the mend in the flanker household. At my phone triage job, we have been dealing with a huge amount of vomiting/diarrhea viral crud that has left kids(and parents) puking and sleep-deprived. We have been very lucky in the Nursedude Domicile, nothing major this winter, aside from the odd cold. The 18-9 scoreline from Murrayfield was kind to the hosts, as France looked formidable. Ireland visiting the Stade de France has the makings of a classic. I will have to miss it as my wife and I leave(weather permitting)for Portugal on Wednsday. 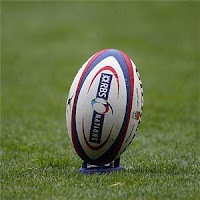 I am hoping to catch Portugal-Georgia in a RWC qualifier in Lisbon.